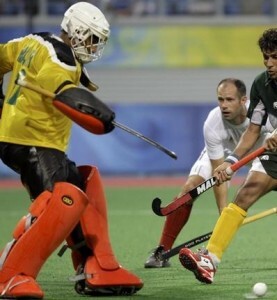 Kicking is fundamental to field hockey goalkeeping; goalkeepers are separated by their ability to pass the ball with their feet. With the ‘foot’ rule for outfield players, we are the only person who is allowed to legally use their feet to our own and our team’s advantage. It is therefore essential that you have good technique to clear the ball when the chance arises. As the only player on the pitch able to kick the ball, and therefore be able to make clearances; controlling rebounds and directing break outs; it is your responsibility to learn how to influence the play and get a strong kicking ability to help your team and reduce rebound goals. 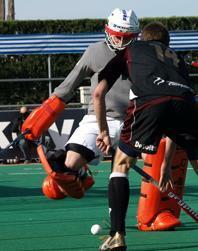 In essence, the kick is great for rebound control and should be used as such to clear away rebound chances. Kicking the ball away from open players; to the corners and over the sideline, or to your sides where there is no opposition will prevent any scoring chances developing from your clearance. By thinking carefully, you will be able to clear the ball away to safety and limit any more possible scoring chances. Learning to kick strongly from both feet gives you more options when facing clearance opportunities. You should be able to make a stronger clearance with the opposite foot on clearances to your current side; left foot on right side, and right foot on left side. By learning to kick from the different feet and bringing your skill up to task, you will have the options that other goalkeepers won’t have; reacting to changes in play to clear the ball away as needed. With the ball near your feet after a save has been made, you can kick the ball to a defender’s stick to help get the ball out of the area. A basic kick suits the need of the situation; not all kicks have to be long, but a simple kick to one of your team mates or away to the side line is sometimes all it needs. Before you kick the ball clear, determine your target area (where you want the ball to end up) and the direction it needs to go in. Follow the ball with your eyes to watch its progress and keep the forward balance; keep your ‘eyes over knees over toes’ throughout to keep your stance balanced and provide a clean, fluid kick clear. As with making saves, a good follow through is needed to get a good clearance. Follow through is everything, once the technique has been learnt; when kicking, push through with the kicker after you have kicked the ball, so that it maintains its angle of direction. Push through with your body, turning your hips and upper body into the move as you push through the kick; following through, up with your leg as you make the kick, to make sure you maintain the ball’s direction. The main and really the only proper method of kicking is to kick with the instep. Some goalkeepers who point out that a kicking motion of moving the leg across to meet a ball at the edge of the angle and causing a redirection who count as a kick. However, every goalkeeper should be taught an active method of kicking where the goalkeeper gets behind the ball, allowing them to get more power behind for the kick for a stronger and more direct kick, for the ball to go a longer distance, whilst keeping accuracy. By getting close to the ball and then clearing with the instep, the goalkeeper has far greater control over its direction and will provide a longer clearance. When kicking with the instep, the kicking leg should be drawn back to knee height, and then released to get full force in the clearance. By angling the kicker diagonally to the kicking side (i.e. left or right diagonally along the angle), the ball will be kicked with greater precision. Have your weight forward (head over shoulders) to keep your balance, so you don’t slip back, and have a strong kick with proper balance to make the best possible clearance. Kick with the inside of your foot for better control; turning the foot to angle it where you want the ball to go.